I moved quite a bit when I was younger, but during those years we often lived in New England. As a kid it was easy to imagine that Halloween was invented in New England. It just seems so suited for it. Old cemeteries, tall, reaching trees with with rattling leaves, and creeping darkness that starts in early evening. The smell of fireplaces and apple cider fill the crisp air. There may be no more quintessential scary New England story than the Salem Witch Trials. 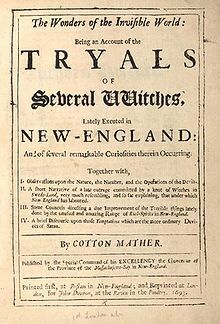 In the summer of 1692 mass hysteria and accusations flew through colonial Massachusetts. We learned about this in school, and read The Crucible in high school. What I wish we had studied was the possible causes of the bizarre chapter in American history. Looking at it now, with the benefit of 300 years of hindsight, it is clear there was no supernatural aspect of it. But what did those two girls see? Why were they having seizures? How did the event snowball to that level of madness? The second idea has to do with the subsequent accusatations more than the initial incident. Two tavern owners were competing for the same business and one accused the other in order to clear the way, so to speak. What do you think of these ideas? Do you have a theory?